The operator of a pregnancy resource center in California says she may have to close its doors unless the Supreme Court, after hearing arguments Tuesday, rules that a state law forcing the pro-life organization to promote abortion is unconstitutional. “Each of us as individuals has to make a decision about whether we’re comfortable working in a center [where the law] is forcing us, well, compelling us, to speak a message that is contrary to our personal … deeply held beliefs,” Christine Vatuone, CEO and president of Informed Choices, told The Daily Signal in an interview. Not only does it affect the women who walk through our doors, not only does it affect us financially, but each one of us—whether it be a donor or a volunteer or staff—it affects us on a personal level too. So the ramifications are pretty far-reaching. 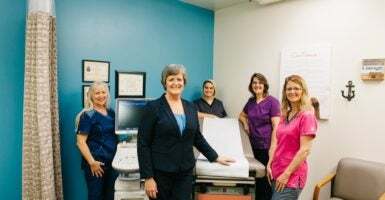 Vatuone’s facility, Informed Choices, is a pregnancy resource center and medical clinic in Gilroy, California, although some pro-life pregnancy centers do not offer medical services. The law passed by the California state Legislature requires “licensed medical centers that offer free, pro-life help to pregnant women to post a disclosure saying that California provides free or low-cost abortion and contraception services,” according to Alliance Defending Freedom, the faith-based legal aid group that represents the pro-life centers in the Supreme Court case. The posted “disclosure” required by the law must include a phone number where pregnant women may reach Planned Parenthood or other abortion providers. Michael Farris, a lawyer who is CEO of Alliance Defending Freedom, will argue the case, National Institute of Family and Life Advocates (NIFLA) v. Becerra, before the Supreme Court. His organization represents the National Institute of Family and Life Advocates, an organization that provides legal counsel to pro-life pregnancy centers such as Informed Choices across the country. The California law also requires unlicensed pregnancy centers, which offer adoption referrals and nonmedical resources other than abortions to expectant mothers, to include “large disclosures about their nonmedical status” in any advertising. 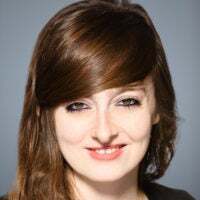 This makes advertising prohibitively expensive for pregnancy centers that operate based on donations, Denise Harle, legal counsel with Alliance Defending Freedom, told The Daily Signal in an email. “It truly would make advertising impossible and completely cost prohibitive,” Harle said. I choose very carefully what I give my energies toward, because the treatments I am on are difficult and I experience a lot of fatigue and difficult side effects. And so the fact that I am giving my time and energy to my center, but also to this case to speak about what we do so the community can better understand—I wouldn’t be doing it if it wasn’t really, really important to me. Vatuone, who is married to a patent attorney, has three children: a daughter, 23, and two sons, 21 and 18. The law is an assault on free speech, Harle, the Alliance Defending Freedom lawyer, said. Vatuone said her clinic in Northern California’s Santa Clara County displays promises on its walls that “we will treat you with respect, we will protect your privacy, we will not pressure you, we will support you, and we will not lie to you.” It would be robbed of its purpose if the Supreme Court upholds the California law, she said. “If what they were seeing on that wall instead was an advertisement essentially for the abortion industry, it would come up pretty clear to them what we stand for, and it would be false,” Vatuone said.